LIBRE for Final Fantasy 7 is here! No more fiddly hex editing to change the properties of limit breaks! EDIT - Updated to version 0.3: PC support added! NOTIFICATION (08/2012): LiBrE does not currently support the 2012 PC re-release. I will work on this for the next version. Full editing of Limit Break attacks - statuses inflicted / toggled / cured, power, damage calculation, special attack flags, elements, animations, sounds, MP cost, targetting data - you name it. This depends on your operating system, really. You have either a standalone Windows Executable that should work for Windows 95+, or a Python File Directory. Python is a programming language integrated into most Linux and OS X distributions. If you have Python 2.5 and the WxPython (a small download) for your operating system, you can just run the 'Libre.pyw' file from either command line or IDLE and work away. The executable comes as a five megabyte 7z file. The Python version is a mere 15kb. To run the Python version on Linux, you will need python-wxgtk2.5+ and python-wxversion. You should be able to find these easily with a package manager. - It's still a bit ugly on certain Windows installations thanks to the shortcomings of WxPython. its ububtu 9.10 with the latest version of wine (i think its 1.1.43 or somthing like that) and VC++ redists for 03,05 and 08 installed and then it worked. Please note i havent fully tested it, just wanted to let you know it runs on wine. Bug reports can be posted here. Or you can email me at the details listed in the helpfile. Oh, and another thing. Limits that are stored in the KERNEL.BIN probably trump Limit Break attacks in the LIMITMENU.MNU, so you will likely need Wallmarket to edit them all. I need to confirm this. where do i find my MNU file, i searched everywhere and i cant find it. my game works fine as well. It is in the MENU directory of the FF7 PSX disk folder. For instance, try X:\MENU\LIMITMENU.MNU, where X is the letter of your CD-ROM drive. Well, it's *very* similar to Wallmarket, and most people with Libre will have it, so I'm guessing that most I would say is redundant. You do the same as you would when editing spells in WM or attacks in Proud Clod - rip the file from disc, set power, algorithms and statuses etc., then use something like CD Mage beta to reinsert the files. Information on what the controls all mean is in the help file. 2. The window layout. What it all means. 6. Copyright, disclaimer (IMPORTANT!) etc. for both the most recent and older versions. 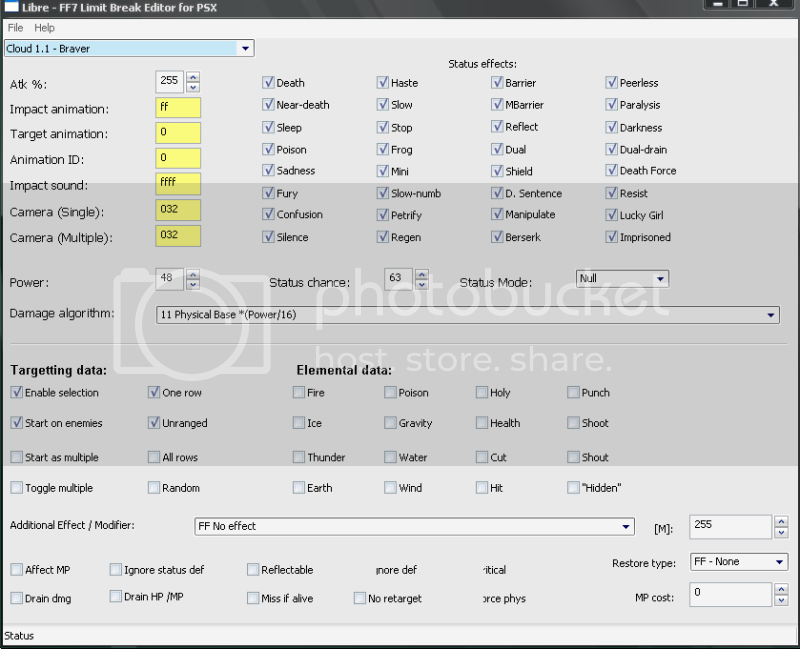 Download the PC executable file, 'Libre FF7 for Windows'. elemental and miscellaneous (at the bottom). A single hex value that determines the animation used. expect lots of glitches in-game if you alter this carelessly. These are two HEXADECIMAL values, each two bytes (0-FFFF). depending on whether one or more enemies are being hit. a negative status in 'inflict' mode. - CURE: Removes statuses. Doesn't miss. chosen. Algorithms determine how damage is calculated. Lets the players choose a target. on the party, have the 'One Row' flag. If true, the cursor starts on enemies. If not, it doesn't. Important if you plan to use One Row (above). If this is a physical attack, is it short range? Attacks with this property target friend and foe alike. Does the cursor allow you to choose multiple or single enemies? target from the group selected. Ahriman's Roulette has this. magic. Cut/shout/etc. are elements of particular weapons. Damage is done to MP rather than HP. 10% of damage is done is drained by the caster/ user. Will inflict statuses, even if enemy is immune. Will drain both HP and a little MP. which ensures the opposite: it hits the KOed, but not the living. Piercing, i.e. ignores Vitality / Spirit. 'no retarget' prevents the usual retargetting of another valid entity. Hits are always critical. Omnislash has this. accordingly, though it doesn't really seem to matter. It's the move's MP cost. then switch back, your changes will still be in memory. can't build a .MNU from scratch. change in the next release. WARNING: ALWAYS BACKUP THE FILES YOU ARE WORKING ON. OR THE PROGRAM. YOU HAVE BEEN WARNED. txt spk or peppered with abusive language get deleted right away. - Did you cancel any operations? I TAKE NO RESPONSIBILITY FOR THE EFFECTS OF LIBRE ON YOUR COMPUTER. im not asking for your source code i am just asking for permission to modify your existing EXE. Sure thing. How do you intend to do it? Bosola i have done it using Molebox, it allows the merging of external files into a EXE. ...Any alternatives that wouldn't necessitate a costly Molebox license? I can't afford to pay ~Â£200 for distribution rights. As for the icon, that's just a matter of making one (that I have the rights to) and passing inclusion as an argument to Py2Exe. some are free and some cost money, i couldnt get any of the completely free ones to work right (could be my own problem though) but the trial version of PEbundle which is the cheapest of the programs seems to work alright. Nice work, I was currently doing the limit editing part in my hack...however, I'll have to keep at hacking at the hex for now, as I found a few bugs at a cursory glance. Minor: Ignore Def, Critical and Force Phys have display glitches that can appear after you hover over them. Major: The program seems incapable of distinguishing between Critical and Drain HP/MP, as it keeps alternating which of the effects to have checked for a move with one of them when loading up a move. Flip between default Omnislash(or Dragon, etc.) and another move to see for yourself. Using Windows XP, for whatever that's worth. Another one, too: I've spotted a major flaw that will make limits cost 255 MP if MP cost is touched. I fixed it, but I screwed up, and mixed up the builds. I'll sort it out NOW. As for the others: I'm on it right now. Fixed! It was a really simple issue! And my own silliness! I'd simply mixed up the two bytes that control the special flags. Meanwhile, because I was using a command called 'SetInitialSize' to alter the sizes of controls, my attempts to use Constrictor to resize were doomed to fail, because that changes the property 'BestFittingSize'. They were both really simple errors. I've also changed the way the text controls handle non-hex figures. I am also about to have the program close if you don't initially select a file. I'm really sorry - I compiled the wrong build (DERP!) and I made a silly mistake. I'll have the app and python files rolled out within the hour. EDIT - First post updated. You should have no more errors. Thank you for highlighting this! I'm very impressed! A job well done! Where is the limitmenu.mnu ? It is only for the psx version at the moment, I believe. it does say "Upcoming PC version support" in the features list. But will be there it for PC ? Sure, there will be. I know the offset for the PC version, so all I have to do is create another 'path' where the different offset is passed as an argument to the 'loader' and 'saver' modules. In the meanwhile, you could just make a dummy LIMITMENU.MNU, make the alterations and then copy-paste in a hex editor. The simplest way to make a dummy file is with Python, using the following code. You will now have a .MNU full of FF characters. You'll have to make all limits yourself, though, which would be a pain. Limits will appear at offset 1324h and end at 1B03h in your dummy file. Limit data starts at 51E0D4h in the PC version. This looks pretty sweet Can't wait for the PC compatibility. There's also another issue I've found, recently, that involves the 'HP Absorb' flag not being 'saved' sometimes. It may be simpler just to go for a 'big push' and release a PC-editing version that fixes the bug too. I have a version of FF7 PC... somewhere, and I know the offsets. Now I just have to find the disc, install, and double-check. Oh, and change the way it starts up, too, obviously (start with all controls disabled). I may also change the delivery system: at the moment, you can download the executable AND the Py2.5 files AND the Py2.6 files, because there are significant differences (for me) between the two versions of Python, but many distros still include 2.5 by default. I may simply go for the option of 'Freezing' one of the 'forks' into a simple Linux and Mac binary. Oh, I might get round to reading up on how to include an icon, too. If anyone wants to suggest a design, shoot. Other than that, things seem ok. I haven't seen any other bugs, but remember, I provide an email for feedback with good reason. I have no idea why the Drain Damage checkbox status is not being 'remembered'. I've been making changes to try and recognize the issue, but none take effect. Unless there's some quirk to the interpreter (reading cached code, rather than what I've written), I have no other ideas left. The changes to the limit data made when saving DrainDmg status to the buffer should match the changes the 'updater' expects. I haven't misnamed the control anywhere it seems, nor should any setting on the GUI / spacing be causing an issue. Why is that one checkbox not saving data? If anyone wants to look at the code and suggest anything, I will gladly credit them. wow another great editor ! ...And now it's working completely fine. For some reason, forcing it to print data (which I did for debugging purposes) seemed to sort things out. I had it print the data being saved and the data being loaded for the special flags, and found the results consistent with what they should be... and the mistake cured itself. Could some more experienced programmer tell me what the hell is going on? I can mostly confirm that this is true. Data for Vincent's, Tifa's, and Cait Sith's limit attacks including Blade Beam's shockwave (the attack indexes that are less than 128) are retrieved from the KERNEL.BIN. That's how this effect was achieved. I just got in a battle with emerald and began that sequence. She can't hit hard enough to kill in one limit chain. I added the "kill regardless of status effect def" to her Final Heaven and that happened. That's really the only one I tested. I haven't tested Vincent's and Cait Sith's, but I know Tifa's are taken from that.